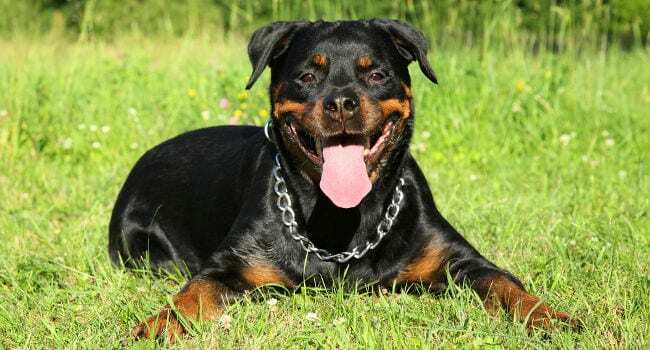 What Specific Food and Nutrition Needs do Rottweilers Have? Do Rottweiler Puppies Grow More Slowly Than Other Breeds? How Many Calories Should Rottweilers Have? Do Rottweilers Have Special Health Needs? What About Food Allergies and Intolerance? If your Rottie plops down in your lap like he thinks he's a toy poodle, enjoy the love! Faithful and loyal, Rotties are uninhibited at home and will do anything for their human family. Like people, Rottweiler males tend to be bigger than females. A male Rottie can stand up to 27 inches at the shoulder and weigh up to 135 pounds, while females are not as tall and should seldom weigh above 100 pounds according to the American Kennel Club. The primary health challenges for Rotties are hip dysplasia and arthritis, along with maintaining a healthy weight. 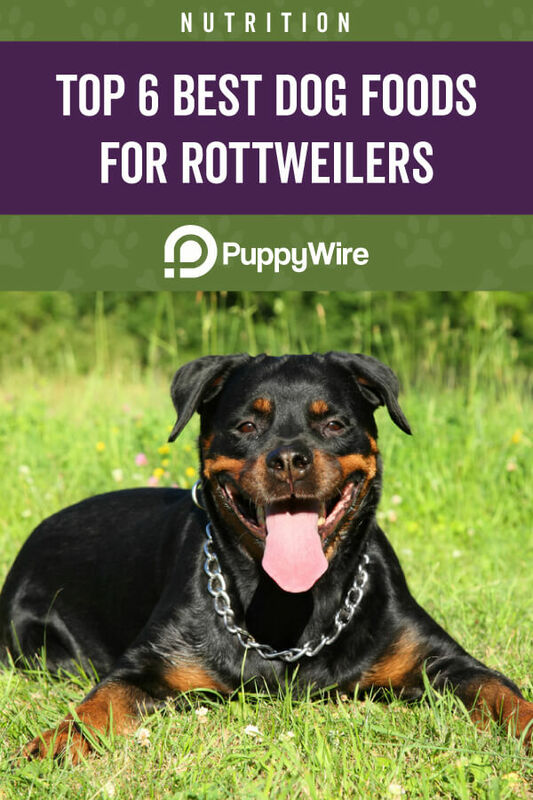 We've put together a list of the best dog food for Rottweilers, whether they are an adult, puppy, senior, or have a sensitive stomach or skin. Rotties are part of the AKC's Working Group and are considered a strong, muscular, "robust" breed. Their size and strength come from their ancestry as ancient Roman mastiffs or guard dogs. Rottweilers have large bodies with well-developed and muscular hindquarters. Their coats are short and glossy black with rust markings. Rottweiler coats should be sleek and glossy and their nails should be strong and short. The breed has strongly developed leg and chest muscles, which like their coat and nails, requires ample protein, biotin, and other essential nutrients. The AKC says that Rottweilers can thrive on high-quality dog food that meets their nutritional needs depending on their age. Like many large-breed dogs, puppies are at-risk of growing too fast, and older Rotties can tend to put on too much weight. Just like human children, Rottweiler puppies go through ages and stages. Rotties aren't considered fully-grown until they are two to three years old. Due to their large size when they're mature, Rottweilers are a slower-growing breed. The majority of Rotties will be fully-grown by the time they are two years old, but the biggest of the breed can be up to three years old before their bones and muscles are mature. Because of their slow-growing nature and large bones and muscles, Rottweiler puppies need food that provides adequate protein, calcium, vitamins, and minerals. Based on their weight and activity level, dogs usually require a few more calories to maintain their weight than humans. A 100 pound adult Rottweiler with an average activity level will require about 2,200 calories to maintain weight. Calories alone aren't the only factor in choosing the best food for your Rottweiler. Nutrition, amount of protein per meal and per day, and micronutrients like minerals, anti-oxidants, and vitamins. As you can see, a Rottie puppy needs more calories than most human children at the same weight and stage of growth. Pregnant females need many more calories, and hard-working Rotties will need more calories than all but the hardest-working, most active humans. One of the biggest concerns with Rottweiler owners is whether or not their puppy is growing properly. Rottweiler growth and development can last up to three years. We've put together some puppy weight and growth estimates for different ages. At birth, a Rottie puppy's eyes are closed and he or she will weigh anywhere from 12 ounces to 1.3 pounds. Rottie puppies can grow fast: sometimes too fast, causing them to "outgrow" their bones and muscles. These pups need the right amount of nutrition at their young age, not overfeeding, especially too much protein. Rottweilers aren't a breed with a high risk of obesity. They can put on weight with age and decreased activity. Like people, dogs have safe weight loss ranges. As muscular dogs, Rottweilers can lose weight effectively and safely with moderate reductions in food, increased activity, and safe vitamin and mineral supplements. Safe weight loss amounts should be no more than 3-5% of weight per month. Light commercial food diets for senior or overweight dogs can be effective. Rottweilers may accept fresh water instead of extra food or treats. Only provide low-calorie treats if you do give occasional treats. Rottweilers have an average level of health problems in comparison to other breeds. The biggest Rottie health challenges are joint and hip problems, including hip dysplasia. Elbow dysplasia (problems with elbow joints in front legs). Aortic stenosis (partial obstruction of the aorta in the heart). von Willebrand's Disease (a blood clotting disorder). Rottweilers can get cancer, with an equal risk to other large breeds including Saint Bernards and Great Danes. A 2002 study showed that early spaying or neutering could contribute to cancer. Exposure to pesticides and toxic chemicals has been shown to increase cancer risk in dogs (and humans). Rottweilers have also been diagnosed with diabetes and heart disease, both related to being overweight. Older Rottweilers experiencing joint pain can benefit from glucosamine. Licking feet or rear end. According to WebMD, dogs can develop allergies at any time. They can eat a food for a long time with no problems, then suddenly develop allergic symptoms. Hill's Ideal Balance Large Breed food for dogs is a good pick for adult Rotties who aren't pregnant, nursing, or have other special needs. The main protein is chicken and Hill's formula uses flaxseed and cranberries to deliver antioxidants and amino acids. The food's first ingredient is chicken. This provides lean protein for your Rottweiler without unnecessary fat. Brown rice is one of the best grains adding fiber and nutrition. A team of 220 food scientists, nutritionists, and veterinarians develop Hill's foods. Micronutrients (vitamins and minerals) are provided through vegetables and fruits. 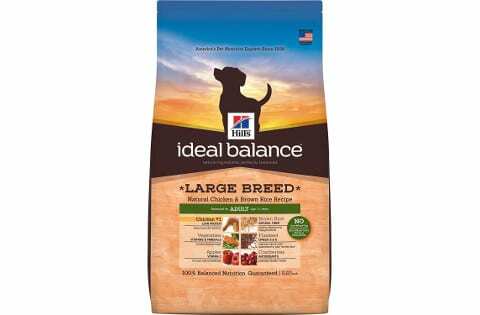 Hill's Ideal Balance for Large Breeds doesn't have wheat, corn, or soy. It's also free of artificial flavors, colors and preservatives, all of which have a potential association with cancer and are currently being researched. Micronutrients include Vitamin A, Vitamin B12, Vitamin D3, and Biotin for a sleek, smooth coat. The formula also includes cracked pearled barley and whole grain oats. Rottie owners who have tried this food say it is effective with weight maintenance. Their dogs enjoy the food and have shiny coats and plenty of energy. Owners reported increased energy, shiny coats, and bright eyes. Picky eaters seemed to enjoy the taste. Has no artificial colors, flavors or preservatives. Owners report the price goes up unpredictably. The food isn't totally grain-free. Unless your senior Rottweiler is very active, he or she won't need an ultra-high protein content food. A lot of grains aren't necessary either, so a good grain-free food is a good choice for Rotties over age 7. 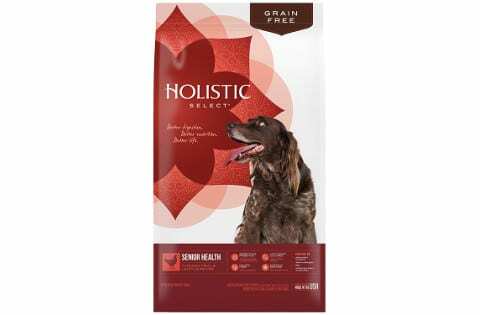 Holistic Select's Natural Dry Dog Food is grain-free and uses all natural ingredients. The food isn't no-fat, it has a moderate fat content of 12 percent. With 28% protein, the food has plenty of nutrition for your older Rottie. The formula also includes Omega-6 and Omega-3 fatty acids for heart health, and glucosamine and chondroitin to support strong joints and relieve any stiffness or pain. The food is designed to support the slowing metabolism of larger, older dogs. It also contains 5.5% crude fiber and probiotics that support digestion and immune health. Owners praised the food's digestibility and said their dog's energy improved. A lot of owners have fed the food successfully for years. The probiotics and digestive enzymes seem to improve digestion and allergies. The brand is somewhat expensive. Owners have complained that bag size is decreasing. Designed for large and giant breed puppies, Eagle Pack's dry food contains balanced nutrition and larger kibble. The formula contains both lamb and chicken for balanced protein content. Rottweiler puppies grow more slowly than many other breeds and continue growing past the 12-month cutoff of smaller breeds. Too much protein can cause growth rate problems, and Eagle Pack's 24% protein content is better for your Rottie's growth rate. Eagle Pack's food also has 6% fat content, which is an appropriate level for growing puppies. The food also has DHA to support eye health and brain development. The food also has probiotics and a full suite of appropriate micronutrients including Vitamin B-12, calcium, Zinc, Vitamin C, Vitamin D3, and Potassium. Owners of Rottweiler puppies and other large breeds praise their pup's growth and energy on Eagle Pack's food. Made from lamb and chicken, the food also avoids beef, the most-common protein that dogs are allegic to. Although it isn't grain-free, the food contains digestible, low-allergenic grains: barley, brown rice, and oatmeal. Eagle Pack has a lot of loyal customers with healthy puppies. The brand is relatively affordable. Ingredients are clearly-identified and the formula doesn't change. Some dogs had vomiting and other digestive problems. Some dogs didn't like the taste. 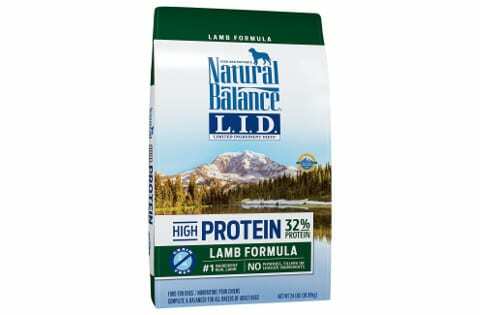 Natural Balance's high protein limited ingredient formula has 32% protein. The #1 ingedient is real lamb. Other protein ingredients are pea protein, lamb meal, and chickpeas. The food also has flaxseed and healthy oils. The food has simple protein and nutrients similar to the type of diet fitness advisers recommend for humans. With the highest protein content of all of the limited ingredient foods, Rotties will gain muscle on this food. Owners praised their dog's activity level and noted that their dogs gained muscle, not fat. A few dogs didn't enjoy the taste, but the majority liked Natural Balance's limited ingredient (L.I.D.) food. Simple ingredients and positive owner reviews. Great response from dogs with allergies. Has enough protein for active, big Rotties. Some ingredients in the brand's food are sourced in China. Some dogs do not enjoy the taste. With plenty of protein and nutrition, less fat, and no grains, Wellness Core's Natural Grain Free Formula should help overweight Rotties to slim down. Turkey, salmon oil, and chicken combine to give your dog needed protein without unhealthy additives and fat. With their muscular bodies and high energy needs, Rottweilers can eat plenty of food and still lose weight. Wellness Core's grain free formula helps to support dogs with weight loss needs by eliminating potentially fattening wheat and corn. Prebiotics and probiotics in the formula support digestion which aids in healthy weight loss. Carbs are high-quality which give your Rottie the energy he or she needs. This formula also includes superfoods like kale, sweet potatoes, broccoli, spinach and apples. There is even a little bit of parsley which might sweeten your Rottie's breath. A number of owners say Wellness Core's food has helped them to lose weight or stay at a stable weight. The brand has 80% more meat than food with grains to help retain muscle. The formula has Omega fatty acids, antioxidants, and probiotics. Owners report successful weight loss. The brand is more expensive than some other foods. Some dogs didn't like the taste or experienced digestive problems. Nature's Variety is made with limited ingredients and includes none of the known allergy-causing proteins or grains. Made with Duck, the formula also has peas and duck meal. This food has no wheat, corn, soy, or dairy. In addition, Instinct's foods are made from raw ingredients, which some owners report helps digestion. The food's nutrient density also means you need to feed fewer cups per meal than less-dense brands of kibble. Large breed owners say that this food is one of the only ones which helped to clear stubborn skin allergies. Owners who knew their dogs were allergic to chicken and beef also had good results with this food. Very limited ingredients help owners with dogs with multiple allergies. The company is focused on making raw, high-nutrient foods. Some dogs that are allergic to chicken are also sensitive to duck. If your Rottie doesn't have food allergies, and isn't a puppy who needs the right formula for his growth or a senior dog who needs slightly-reduced fat and reduced calorie food, chances are that a food with high protein and few allergenic ingredients will be a good choice. 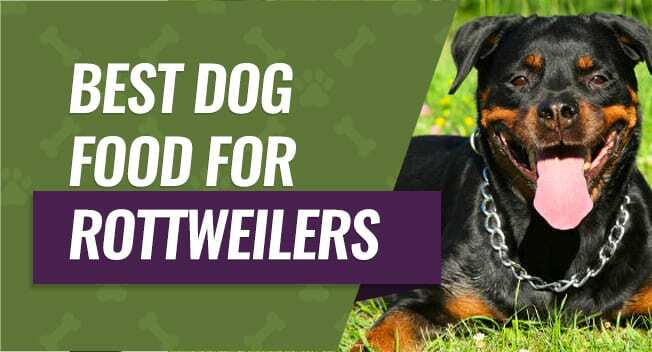 With plenty of lean protein and non-allergenic grains like oats and barley, our choice of the best dog food for Rottweilers is Hill's Ideal Balance Natural Large Breed Dog Food. Ashley Turner has been a passionate Dog Mom to 2 West Highland White Terriers, Lily and Lola, for over 10 years. She now makes a living doing research, writing, and editing of dog-related content for PuppyWire.